HTML or Hyper Text Markup Language which is a type of file format that makes electronic documents or web pages be displayed on the World Wide Web. Tim Berners-Lee first developed it in 1990. Using this markup language, web publishers can create web pages comprising of texts and images. HTML is a series of tags which are in turn integrated into a text document that directs your browser action. You can play both videos and audio files in a browser. You won't require any third-party proprietary plug-ins or codec to embed videos in your web page. Simple and easy to use Input Element Types like password, file, Tel, URL, etc. The canvas feature, which is a rectangular area where you can draw any design, permits a developer to render graphics easily & quickly. With the advanced HTML 5, your web page can store larger files and much more data locally on the host's computer. You can also edit the control contents of HTML. This feature is helpful for developers. There are many other fresh and impressive features of HTML. But along with the advantages, it has few many disadvantages too. To overcome these drawbacks, HAML was released. HAML (HTML Abstraction Markup Language), is an alternative template language that describes the HTML of any web page in a very straightforward and lucid manner without the use of any in-line code. The programs that are to run under HAML code ought to have a .haml extension. It was designed by Nick Walsh and was released on Aug 10, 2015. It is very similar to other web languages like PHP, ASP, etc. As the Markup language is user-friendly, hence it is easy to understand and implement. The markup language is designed to follow the DRY (Don't Repeat Yourself) principle, so it focuses on clear codes while avoiding unnecessary repetition. It integrates itself well with the Ruby code. As the language has a clear structure, hence the logical understanding of final result becomes easy. So, we can very well see that the ever-growing demand of HAML over HTML is not unknown to anybody. HAML is winning over people as it is easy to learn as well as implement. 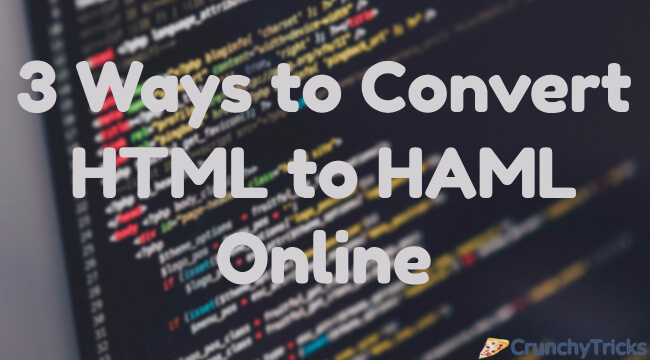 Thus, in this article, a list of 3 ways to convert .HTML files to .HAML files is listed below. After that navigate to the menu bar and click on the option "Text." You will see an option "convert HTML to HAML." Open it by clicking on it. Or you can directly jump to this page by clicking on this link. After the page loads, paste your HTML text in the blank space provided and click on "Convert." And your haml text corresponding to your HTML version is ready. After this page opens up, you can see that there are two ways of converting your .HAML file to .haml file. In the first method, the site lets you convert the HTML text to HAML from a URL. To go with this approach, you need to copy-paste the URL of the website containing the HTML text in the space provide at the top. In the second method, you need to copy paste the whole HTML text which you want to convert. Choose the method according to your comfort & You will find your HAML text in a new window. Upon opening of the page, you can see that there are two methods available. You can copy and paste the URL of the site containing your HTML text in the first blank space and hit submit button to get your haml text. Or else, you input the whole HTML text into space which is below the text "Html (paste your HTML code and press convert)." Then click on "Convert." In the next honk space provided below it, you will find your HTML text converted to haml. Listed above are many methods to change your .html file or template to .haml template. You can use any one of your desired methods.